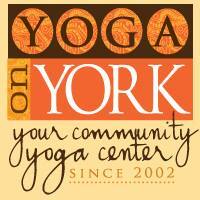 We are a husband- and-wife yoga team celebrating our 11th year of teaching yoga full-time at Yoga On York (est. 2002) in York, Maine. We met in college while both performing in the Florida State University Flying High Circus. Married in 1994, we settled into a happy, typical life of work and starting a family, in South Florida. I (Rae Lynn) dedicated myself to a decade-long career as an Occupational Therapist working with adults and children in physical rehabilitation. Passionate about human anatomy, I also spent my evenings teaching Kinesiology (the study of the muscles and movement) at Palm Beach Community College. Just as ulcers and depression were setting in, from the stress of being the “All American Career Woman-Super Mom”, I found yoga and meditation. “Ah-ha”, life changing! Like any good wife, I effectively nagged Jeff to his first yoga class. Experiencing complete relief from recurring back pain, and significant weight loss, he too was hooked. In 2001, living the quote of Helen Keller, “life is a great adventure or nothing at all”, we sold our home, left our “secure” jobs, and set off in an R.V. to California with son Noah, then age 3, in pursuit of yoga teacher trainings. I completed an Ashtanga 200hr. teacher training at It’s Yoga, San Francisco and together, we completed a 200hr teacher training at the U.S Yoga Association. From San Fran, we choose Maine as a great state to raise children and open a studio. We have continued our yoga education, with a 500hr. Yoga Alliance teacher training in 2006, and many wonderful workshops with Mimi Louerio (O2 Yoga), David Swenson, Beryl Bender Birch and more. Teaching yoga classes, workshops and teacher trainings together is a great pleasure for us. We are passionate about each other, our children, yoga (union), whole foods, wellness and life. Our teaching emphasizes the powerful tool of the breath, anatomical alignment, and bio-mechanically smart sequencing creating intensely mindful and dynamic classes.